The Association of Government Accountants (AGA) serves government accountability professionals by providing quality education, fostering professional development and certification, and supporting standards and research to advance government accountability. AGA is dedicated to the advancement of government financial management by providing or sponsoring appropriate educational programs, encouraging professional development, influencing governmental financial management policies and practices and serving as an advocate for the profession. The Association also serves government officials and the public by sponsoring efforts to ensure full and fair accountability for all public monies and by providing a variety of pro bono services throughout the United States and its territories that support that end. Members can actively participate in association activities through membership in nearly 100 AGA Chapters throughout the United States and around the world. Membership offers an opportunity to exchange ideas, network with peers and gain first hand exposure to governmental financial management issues. AGA sponsors comprehensive programs which allow participants to earn Continuing Professional Education (CPE) for maintaining their licenses and certificates as well as meeting criteria for advancement and other employment opportunities. 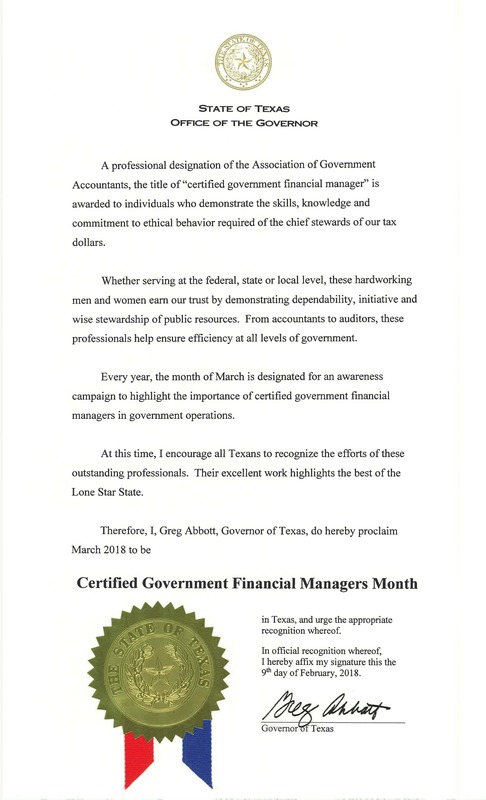 Texas Governor has proclaimed March 2018 as the CGFM month to recognize our CGFM certification holders who have contributed their dedication and services to the federal, state, and local governments. Please click on the following proclamation to see the enlarged view of this document. To help cheer the spirit of the less fornatue up during the holiday seasons, we would like to invite you to make donation to our chapter, and we will distribute them to the charities. If you are interested, please click here to access our donation page at Square.com. Following is the current community service opportunity. Please visit our community service page or click on the following links for more information.